I made for my brothers girlfriend from me and my kids. 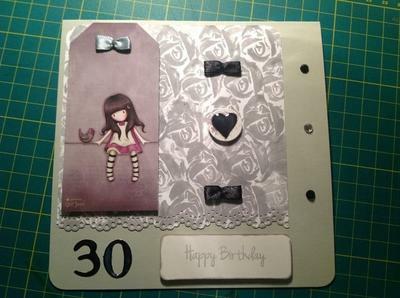 What a pretty card and I love the background stamping of the rose and I am sure that your recipient was delighted with it on her birthday. Get the kids crafting with you ... there are lots of fun and easy ideas for them to try in the Novelty Cards section in the NavBar to your left. Many of them can be done with just some punched or die cut shapes and there are lots of animals and characters for them to make.